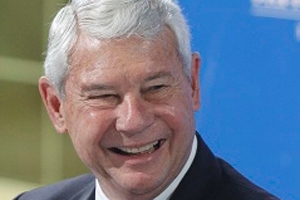 Former Florida Senator Bob Graham will discuss “Four Years Later: Lessons Learned from the Deepwater Horizon Oil Spill” as part of an event honoring the recipients of the William K. Reilly Awards for Environmental Leadership on Thursday, April 24, at 7 p.m. in the McKinley Building at American University. At the event, Dan Esty, former commissioner of Connecticut’s Department of Environmental Protection, and Nsedu Obot Witherspoon, executive director of the Children’s Environmental Health Network, will receive the William K. Reilly Award for Environmental Leadership for their contributions to environmental and energy policy and to the protection of children’s health. William Reilly, administrator of Environmental Protection Agency during George H.W. Bush’s presidency, will also provide remarks. Reilly was co-chair with Senator Graham of the National Commission on the BP Deepwater Horizon Oil Spill and Offshore Drilling to investigate the massive oil spill in the Gulf of Mexico in 2010. The blowout at the BP Deepwater Horizon rig claimed 11 lives and spilled 206 million gallons of oil, and is considered to be the biggest environmental disaster in U.S. history. In addition, Kavita Mak and Jennifer Fernandez, both candidates for master’s degrees in public policy at the School of Public Affairs, will be awarded scholarships for both their academic achievements, as well as their commitment to a career addressing critical environmental and energy issues facing the nation. During his 18 years in the Senate, Graham helped begin the process of restoring the Everglades. As chairman of the Senate Intelligence Committee, he opposed the Iraq war. He recently traveled to Cuba to discuss oil-spill prevention and preparedness. Esty is the Hillhouse Professor of Environmental Law and Policy at Yale University and is the director of the Yale Center for Environmental Law and Policy and the Center for Business and Environment at Yale. In 2011 he was appointed commissioner of the Department of Energy and Environmental Protection by Gov. Dannel Malloy. In 2002, he received the American Bar Association Award for Distinguished Achievement in Environmental Law and Policy. Before joining Yale, he held senior positions in the Environmental Protection Agency. As executive director for the Children’s Environmental Health Network, Witherspoon has been a staunch voice for children’s environmental health over the past decade in Washington, D.C. She also serves as a member of the Environmental Health Sciences Roundtable for the Institute of Medicine, the Friends of Columbia Center for Children’s Environmental Health, a strategy advisor for the California Breast Cancer Prevention Initiatives, and a board member for the Pesticide Action Network of North America.